CBI - China: Day 21 of 154 of the Japanese Invasion of Manchuria. Japanese planes bomb Chinchow as their army begins moving on China's northeast provinces. Spain: Day 84 of 985 of the Spanish Civil War. Spain: Day 449 of 985 of the Spanish Civil War. CBI - China: Day 94 of 2,987 of the 2nd Sino-Japanese War. Day 57 of 106 of the 2nd Battle of Shanghai. Day 38 of 70 of the Battle of Taiyuan. Spain: Day 814 of 985 of the Spanish Civil War. CBI - China: Day 459 of 2,987 of the 2nd Sino-Japanese War. Day 120 of 139 of the Battle of Wuhan. ETO - UK: RAF reconnaissance planes shoot down a German flying boat over the North Sea. Germany: An SS unit executes 20 Poles in the Jewish cemetery in Swiecie. CBI - China: Day 824 of 2,987 of the 2nd Sino-Japanese War. Day 26 of 26 of the 1st Battle of Changsha. The Japanese have retreated, thus giving the Chinese the victory. ETO - UK: Day 33 of 258 of the Blitz. ETO - UK: Day 91 of 114 of the Battle of Britain. The RAF attacks Berlin. MTO: Returning from Alexandria, the Royal Navy is attacked by Italian destroyers and torpedo boats. Italian Navy loses two destroyers and two Torpedo boats, while the UK suffered no loses. East Africa: Day 121 of 537 of Italy's East African campaign in the lands south of Egypt. CBI - China: Day 1,190 of 2,987 of the 2nd Sino-Japanese War. Day 329 of 381 of the Battle of South Guangxi. CBI - Thailand: Day 8 of 221 of the Franco-Thai War (Vichy France vs Thailand). USA: In a letter to Stalin, President Roosevelt promises US military aid to the Soviet Union. Russian Front - Finland: Day 102 of 142 of Operation SILVER FOX, a joint German-Finnish campaign to capture the Russian port of Murmansk in the Arctic. Russian Front - Finland: Day 100 of 140 of Operation ARCTIC FOX, a joint German-Finnish campaign against Soviet Northern Front defenses at Salla, Finland. Russian Front - Finland: Day 109 of 164 of the Battle of Hanko. The Soviets will be forced off their leased naval base. Russian Front: Day 109 of 167 of Germany's Operation BARBAROSSA. Russian Front - North: Day 31 of 872 of the Siege of Leningrad. Russian Front - Center: Day 7 of 98 of the Battle of Moscow. Russian Front - South: Day 62 of 70 of the Siege of Odessa, Ukraine. MTO - Libya: Day 182 of 256 of the Siege of Tobruk. East Africa: Day 486 of 537 of Italy's East African campaign in the lands south of Egypt. CBI - China: Day 1,555 of 2,987 of the 2nd Sino-Japanese War. Day 33 of 33 of the 2nd Battle of Changsha. For the second time during the 2nd Sino-Japanese War, the Japanese have been forced to retreat from Changsha. Russian Front - North: Day 396 of 872 of the Siege of Leningrad. Russian Front - North: Day 157 of 658 of the Siege of the Kholm Pocket, USSR lays siege to the Kholm Pocket but the Germans hold out for a about a year and a half. Russian Front - South: Day 103 of 150 of Germany's CASE BLUE, the failed offensive to take the Caucasus oil fields. Russian Front - South: Day 47 of 165 of the Battle of Stalingrad, bloodiest battle in human history. MTO - Libya: US B-24s attack shipping at Benghazi. East Africa: Day 157 of 186 of the Battle of Madagascar. CBI - China: Day 1,920 of 2,987 of the 2nd Sino-Japanese War. PTO - Alaska: Day 124 of 435 of the Battle of Kiska, Aleutian Islands. The US and Canada will defeat the Japanese invaders. PTO - Malaya: Day 232 of 357 of the Battle of Timor Island, a long guerrilla war ending in Japanese victory. PTO - New Guinea: Day 80 of 119 of the Battle of the Kokoda Track. Japanese troops put up a strong rearguard action against the Australians at Templeton Crossing. PTO - Solomon Islands: Day 63 of 187 of the Battle of Guadalcanal. ETO - Germany: US 8th Air Force B-24s and B-17s attack targets in Germany. This was the first US mission to use the new radar jamming devices. Russian Front - North: Day 761 of 872 of the Siege of Leningrad. Russian Front - North: Day 522 of 658 of the Siege of the Kholm Pocket. USSR lays siege to the Kholm Pocket but the Germans hold out for a about a year and a half. Russian Front - North: Day 13 of 15 of the USSR Kremenchug Offensive into Estonia. Russian Front - South: Day 46 of 122 of the Battle of the Lower Dnieper River, USSR. MTO - Greece: US 12th Air Force B-24s bomb targets throughout the Aegean Sea. CBI - China: Day 2,285 of 2,987 of the 2nd Sino-Japanese War. PTO - New Guinea: Day 20 of 219 of the Battle of Shaggy Ridge. PTO - New Guinea: Day 17 of 162 of the Battle of the Huon Peninsula. Will result in an Allied victory. PTO - Solomon Islands: Day 55 of 56 of the Battle of Vella Lavella. ETO - France: Day 69 of 284 of the Battle of Brittany. ETO - Belgium: Day 37 of 62 of the liberation of Belgium. ETO - Belgium: Day 7 of 38 of the Battle of the Scheldt Estuary. ETO - France: Day 24 of 236 of the Siege of Dunkirk. ETO - Germany: Day 20 of 145 of the Battle of Hürtgen Forest. ETO - Germany: Units of the US 9th Army reach the outskirts of Aachen on the German border. Russian Front - Finland: Day 24 of 223 of the Lapland War. Finland and Russia have joined forces to kick the Germans out of Finland's most northern province. Russian Front - Finland: Day 2 of 23 of the Petsamo-Kirkenes Offensive. The Soviets will drive the Germans out of the Arctic region in northern Scandinavia. Russian Front - North: Day 25 of 41 of the Battle of Riga, Latvia. Russian Front - Center: Day 25 of 72 of the Battle into East Prussia and northern Poland. Russian Front - Center: Day 4 of 18 of the Battle of Memel, a border town of Lithuania and East Prussia. Russian Front - South: Day 3 of 24 of the Battle of Debrecen, Hungary. Russian Front - South: Day 25 of 72 of the Battle of Belgrade, Yugoslavia. CBI - Burma: Day 191 of 302 of the Chinese Salween Offensive in Burma. CBI - China: Day 2,651 of 2,987 of the 2nd Sino-Japanese War. Day 175 of 259 of Japan's Operation ICHI-GO. PTO - New Guinea: Day 299 of 597 of the Battle of New Britain. PTO - New Guinea: Day 170 of 481 of the Battle of Western New Guinea. PTO - Palau Islands: Day 24 of 74 of the Battle of Peleliu (Operation STALEMATE II). PTO - Palau Islands: Day 22 of 36 of the Battle of Angaur. 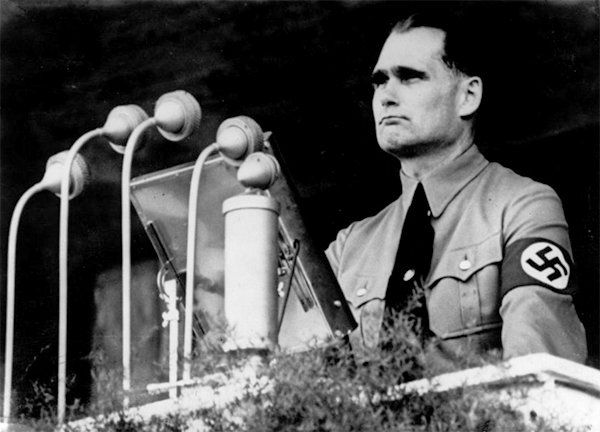 ETO: Former Deputy Führer Rudolf Hess is flown from England to Nuremberg, Germany, to stand trial for war crimes. On the eve of war with the Soviet Union, Rudolf Hess flew solo to Scotland in an attempt to negotiate peace with the United Kingdom, where he was arrested and became a prisoner of war. He was tried at Nuremberg and sentenced to life imprisonment, which he served at Spandau Prison, Berlin, where he died in 1987. After World War II, Winston Churchill wrote of Hess, "He was a medical and not a criminal case, and should be so regarded." Great historical fiction, the second in Phil Ward's "Raiding Forces" series, written by a combat-hardened veteran.